Featuring a quality selection of architectural functional decor and displays for architectural ornamentation sculpture artist editions. The perfect display for your garden plants or smaller sculptures bought here!! Can be cut to sizes, stacked, glued with our epoxy clay! Faux finishes available. Cast stone weighs very much; our poyxporcelain© is about 30 pounds. Poyxporcelain© outer coating with solid lighter weight core. You can imbed rebar or threaded rod to bolt top to column and base to floor for balustrade, stacking, tables or shelves! Architectural available as 1/2 wall or 3/4 corner also! **This is the price for an unpainted high-strength poyxporcelain© model! Fluted shaft Roman Corinthian column. Can be cut to sizes, stacked, glued with our epoxy clay! Faux finishes available. Cast stone weighs very much; our poyxporcelain© is about 20 pounds. Poyxporcelain© outer coating with solid HD close-cell Foam core. You can imbed rebar or threaded rod to bolt top to column and base to floor for balustrade, stacking, tables or shelves! Can be cut to sizes, stacked, glued with our epoxy clay! Glue 2 halves right around existing posts (mailboxes, aluminum, steel wood posts, fences.. Cast stone weighs very much; our poyxporcelain© is about 14 pounds. Poyxporcelain© outer coating with solid HD close-cell Foam core. You can imbed rebar or threaded rod to bolt top to column and base to floor for balustrade, stacking, tables or shelves! Great for buffet countertops, console tables porticos and a wide variety of architectural elements. Exterior or Interior design quality. Can be cut to sizes, stacked, glued with our epoxy clay! Faux finishes available. Cast stone weighs very much; our poyxporcelain© is about 5 pounds. Poyxporcelain© outer coating with solid HD close-cell Foam core. You can imbed rebar or threaded rod to bolt top to column and base to floor for moulding bracket! Can be cut to sizes, faux finishes available. Available custom as Full round, 3/4 corner, 1/2 round, 1/4 round or custom sizes: 3/4 round, slide on, split, solid core.. . Can be custom cast in portland cement also, may require a business delivery address for shipping or pick-up appointment! ..just contact us for any custom artworks! made in USA. Column Table Alter Grid in. 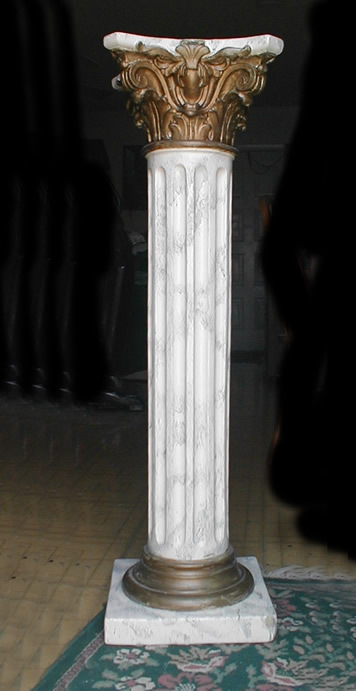 Column Corinthian 38In Table 73 in. Column Corinthian 38In Ballustrade 78 in.